Located 800 meters from the Plaza de Armas along Baquedano up to San Antonio, this fort was built in 1770 on strategic point, with a clear view over the whole of the entrance to the port. It was here that the last Spanish flag flew in Chile in 1826. Located 3 km northeast of the center of Ancud on the Cerro Huaihué, this viewpoint looks out over the whole city. You can also see the Chacao Channel, the island of Cochinos, and further away, the beaches, cliffs and the small bay of Carelmapu on the mainland. This small creek is located 14 km from Ancud. It is a community of traditional fishermen and seaweed gatherers, where you can also sample the local dish, curanto al hoyo, where food, usually including both seafood and meat, is cooked in a pit using pre-heated stones. The local people offer boat trips, and there is also a “pelillo” industry in this area. These penguin colonies are on three small islands located about 25 km southwest of Ancud, lying just off the beach. On these islands you can spot species such as chungungos (sea otters), seagulls, caiquenes and carancas; but what makes the Puñihuil islands unique is the presence of the Magellenic and Humboldt Penguins, which live together in a single ecosystem. Here these two species, which migrate so far, struggle peacefully for survival. You can go round the islands in guided boat trips carried out by volunteers from the Otway Foundation. It is also possible to sail with local fishermen who offer the same trip. Located in the Guapilacuy area of the island, about 28 km northwest of Ancud, this lighthouse keeps a complete record of all maritime traffic through the Chacao Channel. With official authorization, you can take a tour with the lighthouse keeper. In Yuste, near the Fuerte de Ahui, are the quarries for the extraction of Cancagua stone. The workings are in the cliffs facing the Pacific Ocean, and are well known for the manufacture of typical Chilote fireplaces. This river runs through the valley of the same name, about 30 km from Ancud. It is navigable as far as the estuary and there is good fishing. The species to be caught include Fario Salmon, river trout, sea bass and corvina. It flows out into the Pacific Ocean, and around the mouth of the river there are wide, sandy beaches. Further inland there is a beautiful lake with lush vegetation, which harbors a wealth of bird-life. 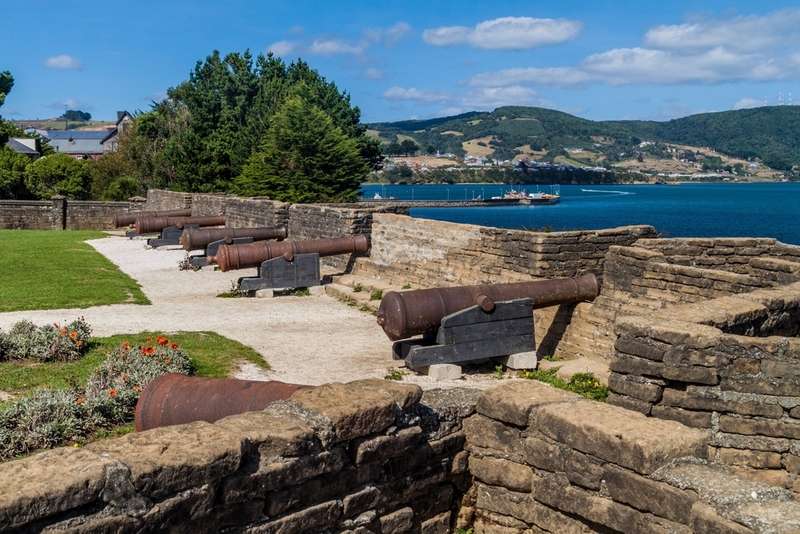 The fort is located 40 km from Ancud on the Lacuy peninsula. It was built in the 17th century from Cancagua stone, and you can still see eleven cannons, the powder store and cells. Ancud Bird Sanctuary is located in Caulín Bay between Puerto de Chacao and Ancud. You can observe a great variety of birds in a lush natural environment, including black-necked swans, pink flamingoes (in autumn and winter), zarapitos, ralladores, several kinds of ducks, herons and seagulls. You can also see the work of craftsmen who still preserve the traditions of the Huilliche people.